Over 1,000 Palestinian citizens of Israel in Umm al-Fahm protested Monday against "price tag" attacks after a mosque in the town was vandalized by suspected Jewish extremists days before. Protesters closed Route 65 and Israeli police were heavily deployed in the area, Palestinian member of the Knesset Taleb al-Sana told Ma'an. Al-Sana said Israel "should arrest members of the 'price tag' gang and prosecute them as a terrorist organization." "However, we are faced with carelessness and recklessness by the ministry of internal security, as the price tag gang has legitimacy in the government," he added. Two other Palestinian MKs attended the protest -- Muhammad Baraka and Raed Salah, al-Sana said. Suspected Jewish extremists set fire to a mosque and sprayed racist graffiti in the town on Friday. Israeli police spokesman Micky Rosenfeld told Ma'an that there was "damage to the front door of the mosque and graffiti found on nearby walls." Israeli police and border police arrived at the scene and are investigating the incident, he said, adding that the attack had "price tag" motives. The Israeli news site Ynet quoted the mosque's imam as calling on the police to "arrest the criminals. Their only aim is to hurt relations between Arabs and Jews." The US Supreme Court, today, decided to hear the case of an American born in Jerusalem, once again taking up the sensitive issue of the status of the contested city. The justices will hear arguments within the case, in the fall, before deciding on the constitutionality of a 2002 law which directs the State Department to give Israel as the country of birth, in passports of Americans born in Jerusalem. His passport says "born in Jerusalem" but his parents want Israel added to the place of birth, putting them at odds with the State Department. Israel claims Jerusalem as its capital, but neither the United States nor the international community recognizes the city -- holy to three faiths -- as such. Then president George W. Bush signed the 2002 bill into law, but he added a signed statement condemning it as unacceptable interference in the president's powers to conduct foreign policy. In March of 2012, the top court ruled that the Zivotofsky suit was legally admissible, without pronouncing on the underlying issue. This time, it will decide whether the president alone has the authority to say who Jerusalem belongs to, in the eyes of the United States. The Obama administration argued at a hearing, in November 2011, that to list Israel as the country of birth would be tantamount to recognizing Jerusalem as the capital of the country. The PLO claims East Jerusalem as the capital of a future Palestinian state, but Israeli negotiators want Jerusalem to be recognized as the "undivided" capital of Israel. Israel occupied East Jerusalem in 1967, and later annexed it, in a move never recognized by the international community. Palestinian farmers in the Salfit district appealed all to Palestinian and international bodies to stop the continued destruction of their crops, caused by the Israeli pigs in the district. Farmers said, "We have encountered heavy losses in our wheat and barley crops, where the pigs destroyed them completely." 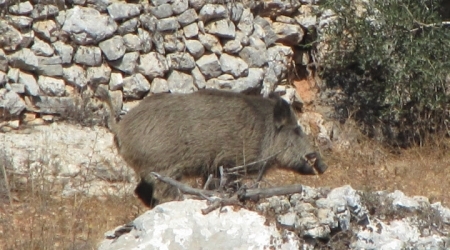 They added, "We tried to get rid of the pigs with all available ways but we have failed", pointing out that the only way is to shoot them; which is difficult due to the miltary's monitoring towers and checkpoints in the area. These Israeli settler assaults are in direct violation of international humanitarian law, and of Israel's obligations under international law as an occupying power. A state of tension has prevailed in the Aqsa mosque following Israeli settlers' desecration of its squares Monday morning under Israeli police protection. Israeli police have searched Palestinian worshipers and checked their IDs before allowing him to enter the Aqsa mosque. According to the PIC reporter in the holy city, Israeli settlers have organized big marches in the vicinity of the Aqsa mosque. More than 40 Jerusalemites were detained during the past 72 hours after confronting Israeli settlers' attempts to break into the Aqa mosque, the sources added. In this regard, Jordanian government has confirmed that it will take necessary steps to safeguard Islamic and Christian sites in the holy city of Jerusalem and defend Muslim worshippers in the Aqsa Mosque. Minister of State for Media Affairs and Communications Mohammed Al-Momani on Monday said that intensive efforts and consultations led by the Jordanian diplomacy are being conducted to emphasize the Kingdom's firm stance against Israeli violations in the Aqsa Mosque. Momani added that under the directives of the Prime Minister, the Minister of Foreign Affairs has instructed the Embassy of Jordan in Israel to take steps to ensure the safety of the Aqsa Mosque and the protection of the worshippers therein. He explained that intense debate with the State of Palestine is underway to study some practical measures that will ensure the protection of Palestinians in Jerusalem, deter and prevent Israel from implementing its rejected plan to divide al-Aqsa Mosque and halt the Israeli soldiers' continued attacks against Palestinian worshippers. "These steps will be taken with the support of the Arab League and the Organization of the Islamic Cooperation as well as a number of European Union countries," he added. Momani has called on supporters of peace and justice across the world to intensify their efforts to protect the identity of the holy city, preserve its authenticity and heritage and to express their clear position regarding the recent Israeli violations against the Aqsa Mosque, which he said is being exposed to the fiercest Israeli campaign. The Jordanian minister also stressed his government's harsh condemnation of the Israeli government's protection and strong support for Israeli settlers' break-ins into Al-Aqsa Mosque in total provocation to Palestinian worshippers. He also expressed Jordan's rejection of Israel's decision to ban Islamic endowment staff's access to the mosque, adding that this Israeli measure violates the peace treaty between Israel and Jordan and the international law. Israeli policemen yesterday smashed a number of the Aqsa Mosque's gates and removed a number of its windows before spraying pepper gas on Palestinian worshippers inside the Mosque, resulting in serious injuries among them. Groups of Settlers on Monday raided the al-Aqsa Mosque through Bab al-Magharbeh (Mughrabi gate), under the protection of Israeli police. 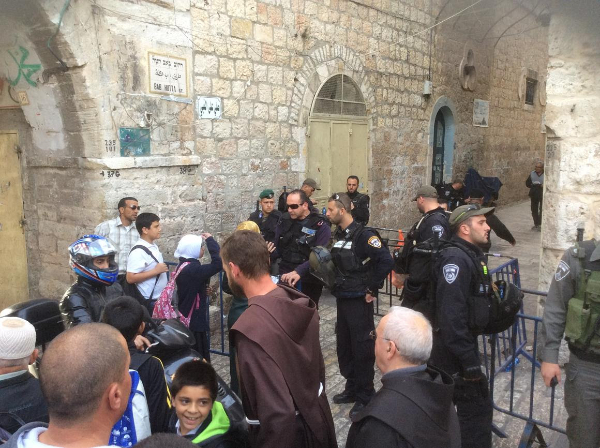 The Israeli Police stationed at the main gates of the mosque, imposed restrictions on Palestinian worshipers, especially the young generation; as they detained their personal IDs until they come out of the mosque. 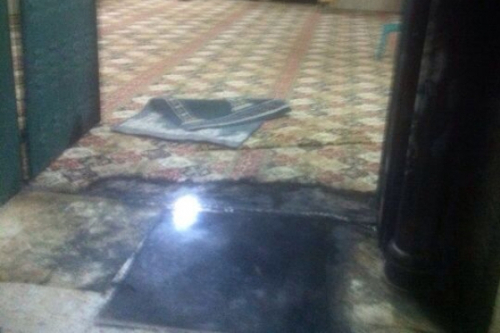 Dozens of Israeli police were deployed in the mosque's compound and its surrounding areas. A large number of Palestinian worshipers participated in the al-Fajer Prayer and stayed in the mosque's compound, as hundreds of settlers raided the mosque in small groups. 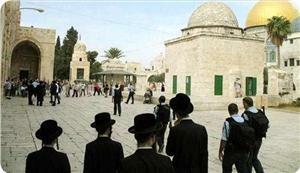 Israeli Settlers stormed on Monday morning the courtyards of Al-Aqsa Mosque through Bab al-Maghareba Gate under the protection of the Israeli police. According to Palestinian sources, Israeli settlers stormed the mosque in small groups and carried out tours at the mosque's compound. It pointed out that the occupation forces imposed strict procedures on the entry of worshipers to the Al-Aqsa, especially young men and women, and confiscated their identity cards. 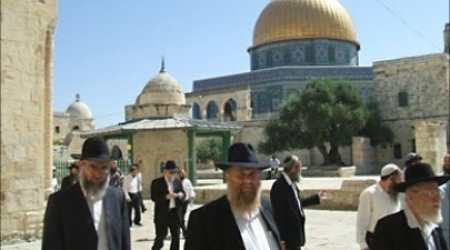 Extremist Israeli settlers and politicians have lately been violating the sanctity of Al-Aqsa Mosque almost on a daily basis and always under the protection of armed occupation forces, who often attack Palestinian worshipers trying to protect their holy site. 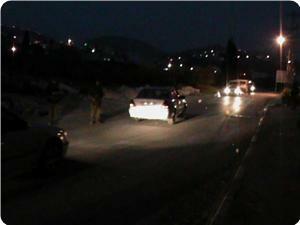 Dozens of Jewish settlers attacked Palestinian cars passing along the Nablus-Qalqilia road on Sunday evening. Local sources said that the settlers, who organized a march on the occasion of Passover, pelted Palestinian cars with stones causing material damage to a big number of them. Jerusalemite sit-inners confronted Israeli Occupation Forces (IOF) and settlers who stormed the mosque on Sunday morning and sustained several injuries in the process. Several Palestinian citizens were left wounded during the confrontations that broke out as IOF shot the non-violent Palestinian sit-inners with tear gas canisters and rubber-coated bullets. Extremist Knesset member Moshe Feiglin, backed by Israeli invading troops, raided holy al-Aqsa Mosque via Bab al-Silsila gate. 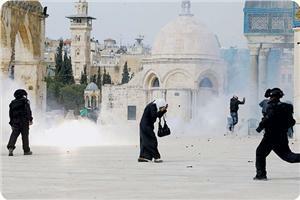 According to a PIC news reporter, the peaceful sit-inners were violently assaulted by IOF near and within al-Aqsa gates. Several youngsters were attacked by batons, pepper gas, bullets, and tear gas canisters. Many Palestinian civilians were left seriously wounded. IOF soldiers have also closed the Mosque’s main gates so as to deny the peaceful Muslim congregation aged less than 50 the right to perform their prayers within the Mosque. Along the same line, IOF arrested last night 5 Jerusalemite youngsters including a journalist, blocking any authentic coverage of events. Violent clashes broke out between Jerusalemite youngsters and IOF soldiers in Saadiya suburb near al-Aqsa, down to Bab Hitta quarters adjacent to the Mosque. PIC news reporter further documented ongoing confrontations between IOF troops and Palestinian native youth in Bab Hitta, where hundreds of Palestinian youngsters and women, who came to pray in al-Aqsa, were banned to enter by IOF. The incident coincides with chairman of the Knesset subcommittee responsible for the execution of Israeli policies in al-Aqsa David Tzur’s call to ban Palestinian Muslims from entering al-Aqsa. Israeli radio quoted Tzur as saying: “Jewish visitors should have easy access into al-Aqsa courtyards.” Ironically, in Tzur’s view, the decision serves Israeli’s interests just as it does Palestinians’. Jewish settlers used hand saws and other sharp tools to chop down more than 100 olive trees in Ras Karkar village to the north west of Ramallah on Sunday. Eyewitnesses said that the settlers claimed that they cut the trees because they owned the land that was confiscated to be their own property. They added that the settlers were routinely attacking lands in Ras Karkar and other nearby villages at the pretext that they owned the land and that it was annexed to their settlement. The Aqsa Foundation for Endowment and Heritage revealed Israeli Knesset’s extremist vice-president, Moshe Feiglin’s pre-arranged attempt to raid holy al-Aqsa Mosque on Sunday morning. The Aqsa Foundation said in a statement on Saturday that Feiglin has called on his supporters to head in masses to al-Aqsa Mosque for a provocative desecration tour. IOF already closed most of al-Aqsa gates, where several iron barriers were erected. Palestinian citizens aged less than 50 were denied access into the Mosque to perform their religious prayers. Sunday projected break-ins make part of Israeli Occupation Authorities’ (IOA) bullying campaigns against the peaceful Muslim congregation and non-violent sit-inners. IOA have never ceased to, unjustifiably, execute tough measures and penalties against every single event or person attempting to defend the sanctity of holy al-Aqsa Mosque. Such arrest orders against Palestinian civilians “are alleged reasons to execute Israeli division schemes of al-Aqsa by authorizing the arrest of non-violent sit-inners under the administrative pretext and without any legitimate charge”. 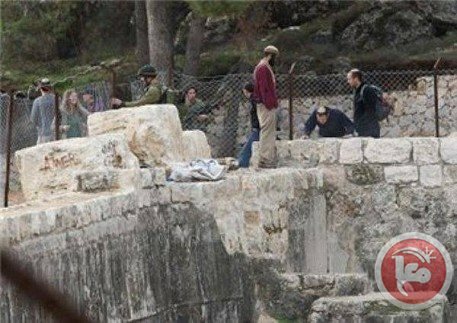 More than 200 Israeli Jews accompanied by Israeli soldiers visited the historic Solomon's Pools between the southern West Bank villages of al-Khader and Artas south of Bethlehem on Sunday morning, a local spokesman said. Adnan Atallah of the local committee against Israeli settlements and the separation wall told Ma'an that Israeli soldiers escorted the settlers, who performed Passover rites near the historic pools. 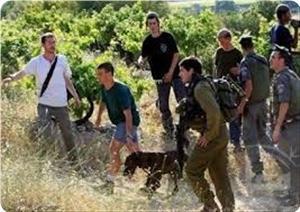 Settlers also visited the Khirbet Alya neighborhood of al-Khader south of Solomon's Pools. 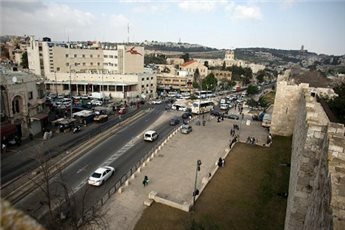 The visit to the site near Bethlehem comes in the final days of the Jewish holiday of Passover, during which Israeli authorities have shut down checkpoints to Palestinians for extended periods of time and have restricted their access to holy sites, such as the Ibrahimi Mosque in Hebron and the Al-Aqsa compound in Jerusalem. 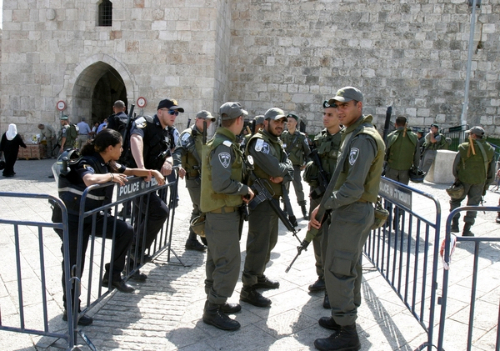 Visits by Israeli Jews to sites across the West Bank often cause tensions with local Palestinians, as these visits are accompanied by large armed escorts. Solomon's Pools are three large cisterns -- each more than 100 meters long -- that were historically part of an ancient aqueduct system connected to Jerusalem. Ottoman Sultan Suleiman the Magnificent repaired the cisterns in the 17th century and built a fortress beside them, which still stands today. Many Jews, however, believe that the pools are named for the Biblical Solomon. Israeli forces clashed with local Palestinians near Joseph's Tomb east of Nablus on Sunday morning, locals and Palestinian security sources told Ma'an. The clashes broke after hundreds of Jewish Israelis arrived at Joseph's Tomb around midnight and performed religious rituals at the site, escorted by dozens of Israeli military vehicles. Palestinian security sources said more than 30 Israeli military vehicles stormed Nablus before midnight and were deployed around Joseph's Tomb near Balata refugee camp east of the city. 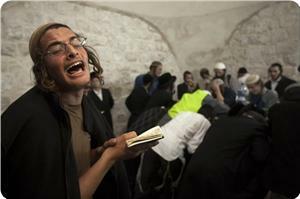 Shortly after that, dozens of buses and private cars belonging to the Jewish Israelis arrived and hundreds began to perform religious rites, staying until early morning hours. Witnesses said Israeli troops fired tear gas canisters and stun grenades at young Palestinian men who pelted military vehicles with stones and empty bottles. No injuries or detentions were reported. Jewish groups frequently visit Joseph's Tomb under the protection of Israeli forces, who deploy heavily in the area and often get into clashes with youth from the neighboring Balata refugee camp during these visits. Despite lying in an area under Palestinian authority deep in the West Bank, Israeli forces maintain control at the site and prohibit Muslims from praying there. Many Palestinians believe that Joseph's Tomb is the funerary monument to Sheikh Yusef Dweikat, a local religious figure. Others believe that the tomb belongs to the Biblical patriarch Joseph. The area is sacred to Jews, Samaritans, Christians and Muslims alike. More than a dozen Palestinian worshipers were detained as clashes broke in the Al-Aqsa Mosque compound on Sunday morning between worshipers and Israeli forces who stormed the courtyards firing stun grenades and rubber-coated bullets. The raid comes amid frequent clashes in recent days after right-wing Jewish groups urged Jews to flock to the compound -- which they believe is the site of a former Jewish temple -- and conduct Passover rituals inside. Director of Al-Aqsa Mosque Omar Kiswani told Ma'an that more than 400 police officers stormed the courtyard of the Al-Aqsa Mosque through the Moroccan Gate and the Chain Gate escorting Ultra-Orthodox Jews other Jewish visitors into the compound. Israeli forces, Kiswani said, "besieged" worshipers in the southern mosque "attacking them with clubs and pepper spray," after clashes broke out with Palestinian worshipers in the compound. Kiswani said that Likud member of Knesset Moshe Feiglin had also entered the compound during the raid, accompanied by special security units. Feiglin has visited the site frequently in recent months, and he has vocally supported the extension of Israeli sovereignty over the compound. Earlier on Sunday morning, clashes erupted outside the Lions' Gate (Bab al-Asbat) and Gate of Remission (Bab al-Hutta) of the Al-Aqsa compound when Israeli police denied hundreds of worshippers access to the compound. 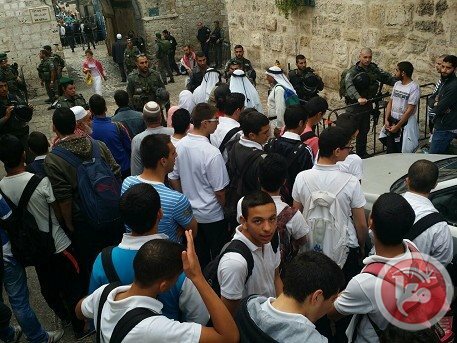 Witnesses said that Israeli officers denied all Palestinian residents of Jerusalem access to the compound including students who attend schools inside. Men and women were also attacked with clubs and pepper spray, witnesses said. Israeli forces detained a young man after he was beaten brutally. Israeli police spokesman said in a statement that police had detained 16 Palestinian "rioters," adding that they were all detained "as they threw stones/blocks at officers at the scene this morning." He also said that two police officers lightly injured in the clashes, which broke out after the Palestinians threw stones as "tourists visited." About 100 Muslim worshipers have decided to stay inside the compound day and night throughout Passover after right-wing Jewish organizations called for Jewish worshipers to enter the area en masse for religious festivities. Israeli occupation forces (IOF) rounded up three Palestinians while standing at a bypass road near a settlement in Ramallah on Saturday night. 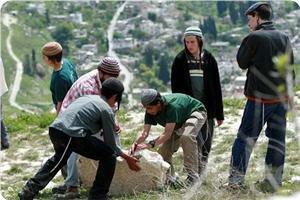 Radio Israel claimed that the three were arrested for throwing stones at settlers and army vehicles. 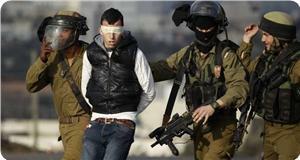 It said that the three young men were detained near Tarmisaya village to the north of Ramallah. 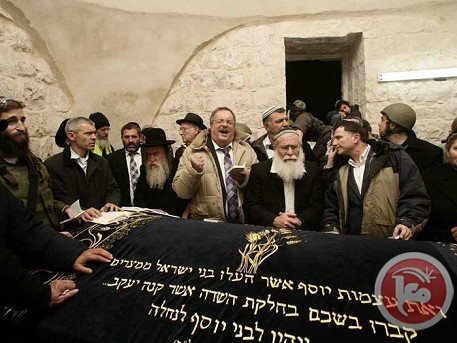 Hundreds of Jewish settlers converged on Yusuf tomb in Nablus city at dawn Sunday under protection of the Israeli occupation forces (IOF). Eyewitnesses told the PIC reporter that hundreds of settlers arrived at the site in busses escorted by IOF patrols. They said that the settlers performed religious rituals and stayed at the site for more than three hours. Confrontations were reported between young men and IOF soldiers, who were deployed in the vicinity of the tomb, locals said, adding that the confrontations extended to the entrances of Asker and Balata refugee camps. 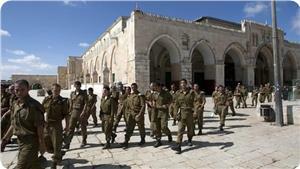 Israeli authorities on Friday imposed restrictions on the entry of the Palestinian worshipers to al-Aqsa Mosque. Media outlets reported that the Israeli authorities prevented Palestinians, who are less than 50 years old, from entering into the mosque to perform the Friday prayer. The Israeli authorities continue to prevent the Palestinian worshipers from entering the mosque, while allowing groups of Israeli settlers to enter the mosque at the pretext of the Jewish holidays. 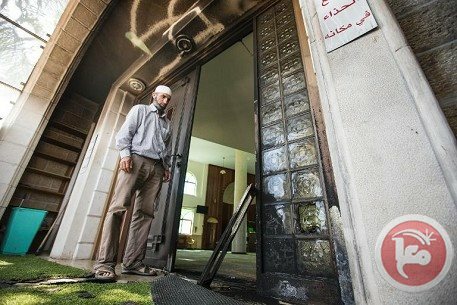 Extremist settlers on Friday set fire to the entrance door of a mosque in Umm al-Fahem village in the 1948 occupied territories. The settlers also spray painted words "Arabs out" on its walls. Umm al-Fahem police has launched an investigation into the incident. Suspected Jewish extremists set fire to a mosque and sprayed racist graffiti in the town of Umm al-Fahm on Friday, an Israeli police spokesman said. Mickey Rosenfeld told Ma'an that there was "damage to the front door of the mosque and graffiti found on nearby walls." Graffiti on the walls in the town read "Arabs out", according to Israeli media. In early April, Jewish extremists slashed the tires of over 40 cars and sprayed racist graffiti in the predominantly Christian town of Jish in northern Israel. "Only goyim should be evacuated from our land" was sprayed on village walls. A week earlier, Jewish extremists sprayed anti-Christian graffiti on the walls of a convent west of Jerusalem and damaged vehicles parked nearby. Slogans including "Mary is a cow," "price tag" and "America (is) Nazi Germany" were sprayed in Hebrew on the walls of the Roman Catholic sanctuary. In early January, Jewish extremists sprayed graffiti reading "Death to Arabs," "No to Coexistence," and "Arabs = Murderers" on a building in Jaffa. In the same month, a group of settlers set fire to the facade of a mosque in the Salfit village of Deir Istiya and sprayed racist slogans on its walls.